"My favorite recipe for a zucchini bread with a hint of coconut. Make sure to squeeze out as much liquid from the zucchini as possible after grating, otherwise the cake can get too mushy." Combine flour, coconut, baking powder, baking soda, and salt in a bowl. Beat sugar, oil, vanilla sugar, and cinnamon in a separate bowl with an electric mixer until foamy. Place grated zucchini in a colander in the sink. Squeeze out as much liquid with your hands as possible. Add zucchini and eggs to the sugar mixture and mix well. Stir into flour mixture until well combined. Pour zucchini batter into the prepared loaf pan. Bake in the preheated oven until a toothpick inserted into the center of the cake comes out clean, about 1 hour. Cool in the pan for 10 minutes before inverting onto a wire rack to cool completely. 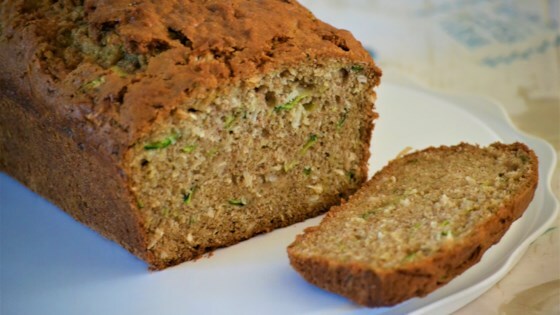 This zucchini bread can easily be frozen. I usually cut the loaf into slices and freeze them in individual bags.